Desserts are a drag. There, I’ve said it. I’ve finally gotten off my chest what I’ve been thinking for years. Don’t get me wrong – it’s not eating them that’s the problem (I wish). It’s making them. Most desserts – baked at least – require a level of precision and measuring that gives me a headache. Was that 1 cup of flour or 1-½? Was that baking soda or baking powder? And the problem is that you can’t shrug off your mistakes because in baking it matters. A lot. So you’re having someone over for dinner. 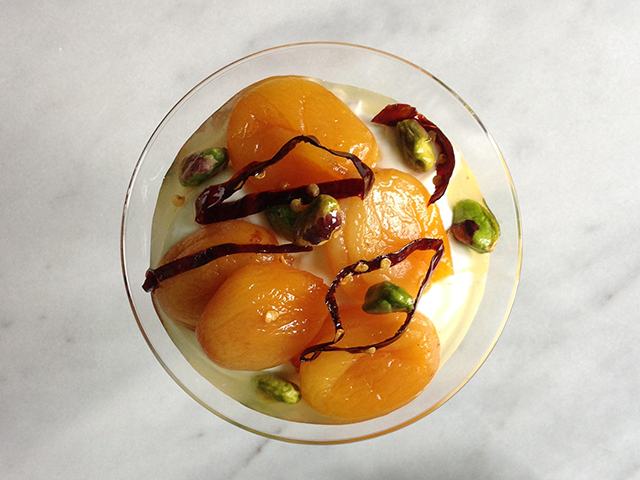 You can buy dessert and either a) try and pass it off as your own (and probably get caught and ritually humiliated), b) give baking a go and risk serving chocolate hockey puck for dessert, or c) make our Poached apricots with chile & pistachio. What’s so hot about this recipe? First of all it’s delicious. 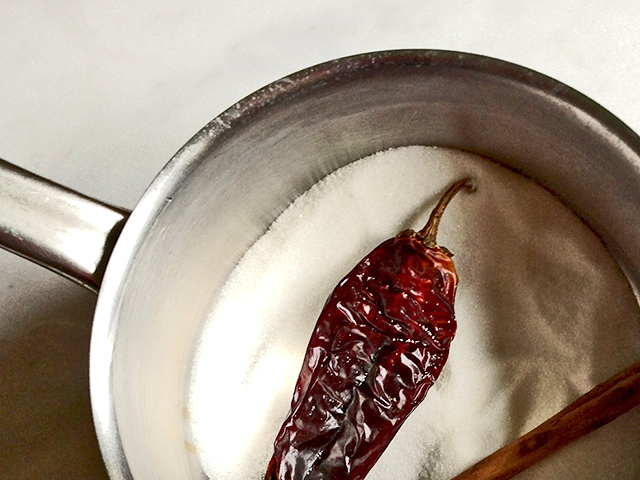 The chile cooks in a sugar syrup with the apricots and becomes soft and chewy – like an adult spicy candy. 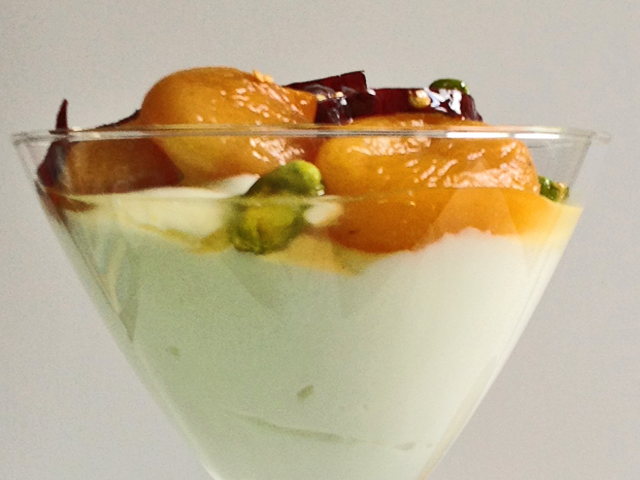 The pistachios add crunch and the apricots are soft billowy bits of yumminess. The second reason is that it’s incredibly easy. You can do the whole thing the day before, pull out a container of Greek yogurt or vanilla ice cream and you’re done. Voila! Your guests love you and no headache. Now that’s sweet. I love the combination of cinnamon and chile but I find cinnamon can be a bit aggressive so I take out the cinnamon stick about halfway through the cooking. That way you get the cinnamon flavor without it overwhelming the dish. 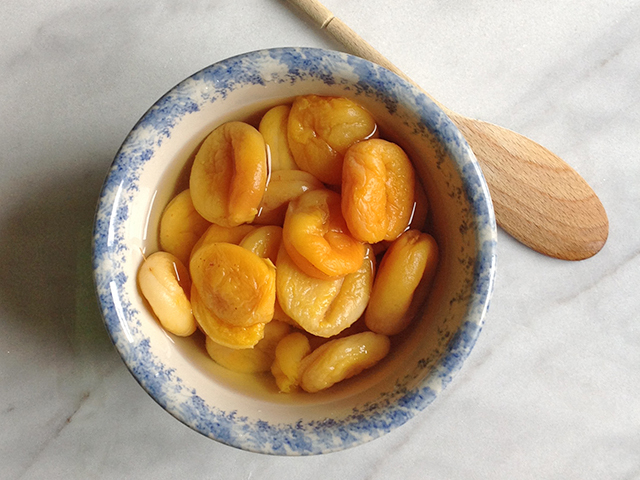 Place the apricots in a bowl and cover with water. Let stand for at least one hour but preferably overnight. 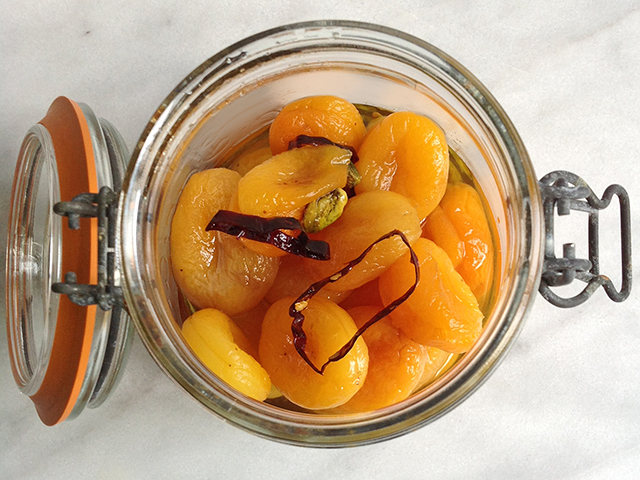 After they have soaked, drain the apricots and set aside. In a saucepan, combine the sugar and water and heat on the stove until the sugar is dissolved. Add the cinnamon stick, chile and drained apricots and cook over low heat for about 10-15 minutes, until the apricots are cooked through but not mushy. The sugar and water will have thickened to a nice syrup by this point. About halfway through cooking, taste the syrup and remove the cinnamon stick if desired. 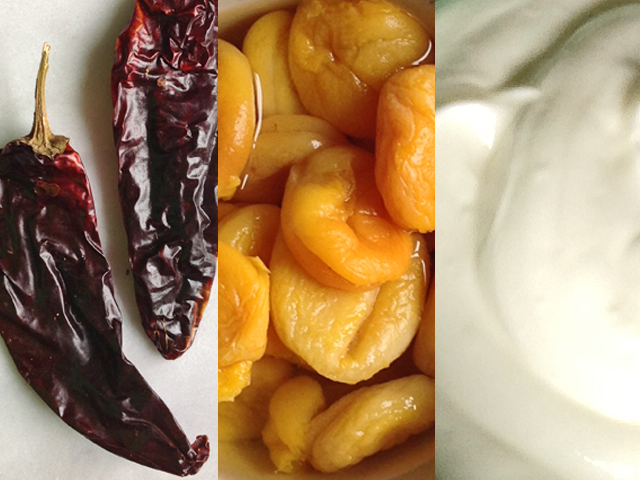 Once the apricots are cooked, remove the pan from the heat and take out the chile. Slice the chile thinly and return to the apricot and sugar syrup mixture. Cool and serve with ice cream or Greek yogurt. Store any leftovers (yeah, right!) in a jar in the refrigerator.